I make a point of including some kind of wild-caught fish in our diet at least once a week. This week’s fish was some cod fillets. 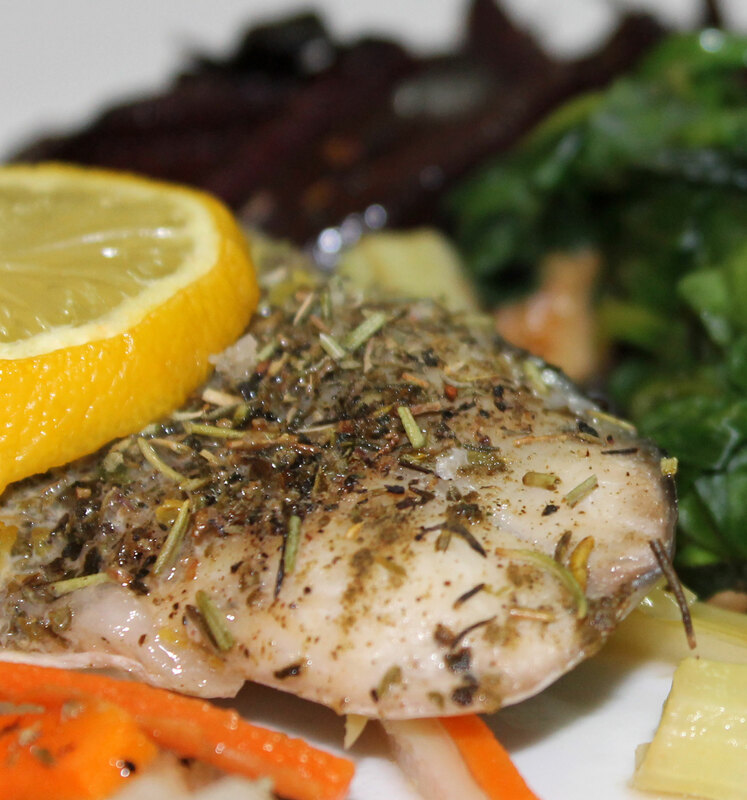 I like to cook my fish very simply – often just oven baked, grilled or pan-fried. I don’t like fish messed around with too much. 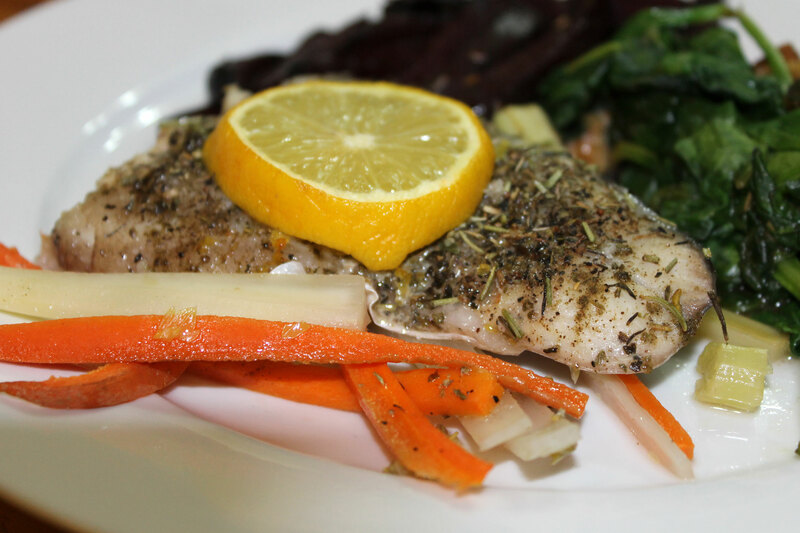 In this case, I sprinkled the cod with plenty of herbs, drizzled over a little olive oil and baked it in the same oven that I was cooking the beet fries in. The walnut pieces in the greens are an AIP stage 2 reintroduction. If you need a 100% AIP recipe, just omit the walnuts. Place the beet fries on a large, rimmed baking sheet and toss with the coconut oil, salt and thyme. Bake in the top shelf of the oven for 30-40 minutes until the fries are tender and starting to crisp up a little. Place the onion, carrot and celery in a baking dish and top with the fish fillets. Drizzle over a little olive oil and scatter the fish with the herbs and garlic and sprinkle with salt. Now sit a slice of lemon on top of each fish. Slide the baking dish into the oven underneath the fries and bake for 10-15 minutes until the flesh is opaque and flakes easily. Do not over cook the fish or it will be dry. 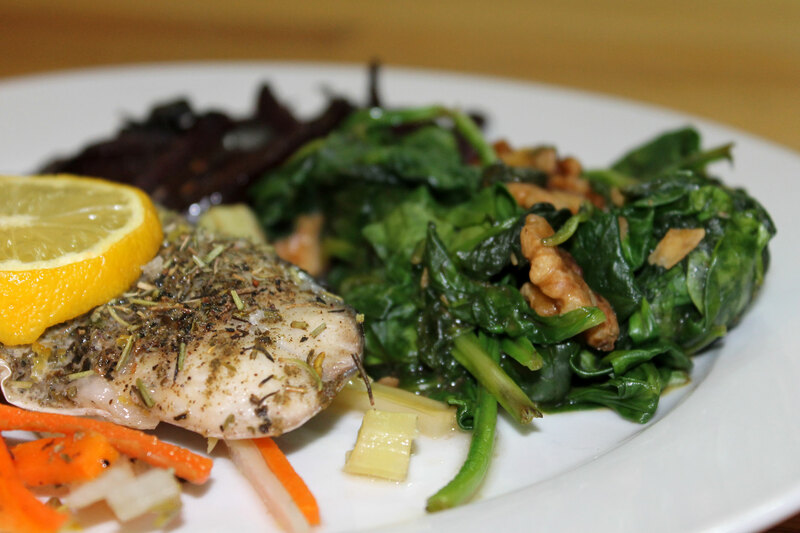 While the fish is cooking, prepare the greens. Put the walnuts in a large skillet along with the coconut oil and toss over a medium-high heat until they are toasted. Add the greens and toss well until they are wilted and combined with the walnuts. 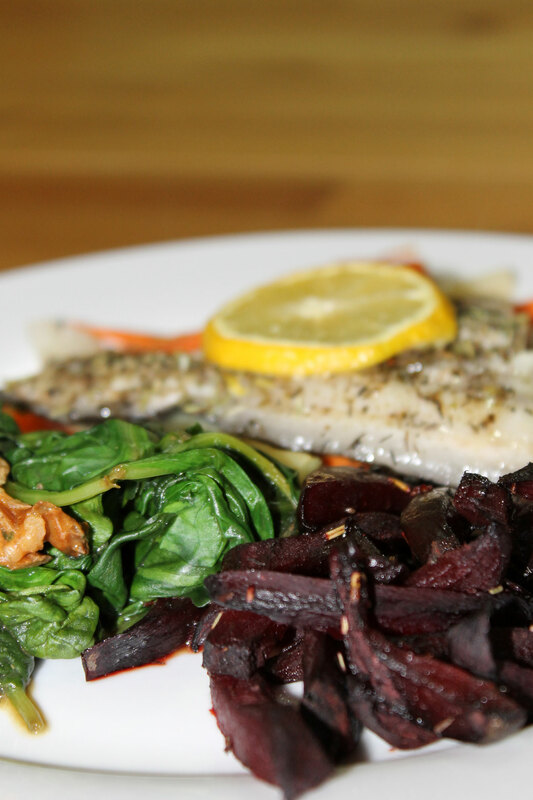 Serve the fish with the veggies it was cooked with and the beet fries and greens. 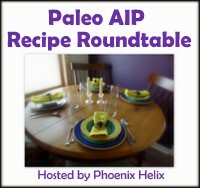 This entry was posted in Autoimmune Protocol Foods, Recipes, Stage 2 Reintroduction and tagged fish, healthy, oven-baked, paleo, primal. Bookmark the permalink. Looks amazing! Great post and blog. Check out my blog for inspiration on living a good healthy life!